LEDs, resistors, toy wheels, and fans The PIRL space is designed to facilitate the kind of learning environment that allows for creativity, flexibility, and collaboration. The tables can quickly be configured to accommodate pairs, small groups, and large groups. They also fold up, roll, and nest into each other when not used. Most of the walls are writable surfaces, one with a SMART interactive projector that makes it a touch surface as well. Electrical pull-downs are placed in the ceiling for easy access to power anywhere in the room. A giant wall for storage, a green screen filming area, and two audio recording studios complete this indoor space. Just outside, accessible through a roll-up garage-style door, is an additional work area for students that also includes a large wall with writable surface. Students maneuver between these two spaces when working on larger projects. One person in a group might need to design a part in 3D, while another needs to measure and cut a piece of wood. Student work depends on the goals of the project and the direction that students choose to take in their design and construction. The two learning spaces complement each other. They also work in sync with the art room and science lab. While providing the space and tools is integral for deep project exploration, the process only works due to an allowance for flexible time and the support of trained personnel. The school’s technology staff is trained in the use of the various tools in PIRL and PIRL Terrace. They have also built flexibility into student schedules so that trained personnel can provide in-class support for other faculty when using the spaces. Students design and 3D print fins necessary for submarine navigation. • D.E.E.P. : About half of the 8th-grade class participates in the Diving Educational Enrichment Program (D.E.E.P). This third-trimester unit integrates STEAM concepts with underwater diving in order to explore and test laws such as Boyle’s Law, Charles’s Law, Henry’s Law, and the concepts of buoyancy and pressure. For students who opt to design and build underwater submarines as part of their experiment, access to 3D design and printing is essential for the creation of unique parts with custom measurements. Students might design fins or propellers in TinkerCAD and then print them out at their desired size. The ability to quickly create a prototype is essential so that students can test out parts and return to the design phase if they run into problems. Students design Chinese characters by hand, live trace them in Illustrator, and laser cut on wood. • Ancient Chinese Inventions: In 8thgrade history class, students studying ancient Chinese inventions are given the opportunity to build a replica of their choice. Projects have ranged from a life-sized, two-sided axe, to a crossbow with working trigger mechanism, to working woodcut stamps. Students use Illustrator to design pieces and laser cut their parts in wood. They might also choose to design in 3D using TinkerCAD or 123D Design and print out the final product in plastic. Students working on a distance-sensing robot using a Hummingbird kit. • Summer STEAM Institute: During the summer, St. Matthew’s offers a week-long STEAM institute for the Boys and Girls Club of Venice and the Neighborhood Youth Association. The theme for the week is “Breaking the Code.” Students can explore The Code of Language by discovering Shakespeare, The Code of Life by exploring DNA, and The Code of the Computer by learning programming. One aspect of this week is to design an interactive display of some kind, using a Hummingbird robotics kit and recycled materials. Students learn to program their Hummingbird board using Create Labs Visual Programmer, which allows them to sense the environment through distance measurement, ambient light, sound, and temperature. In reaction to changes in the environment, LEDs can light up and blink and motors can rotate. Students build around this robotic platform, using wood, cardboard, and an assortment of recycled and repurposed materials. 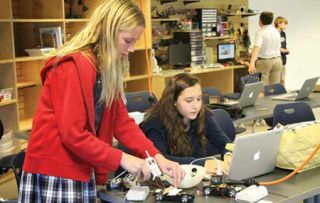 St. Matthew’s Parish School believes that the maker movement is more than just a movement, particularly in education. The work of their students represents a true shift to a more hands-on, real-world, authentic form of learning. The school has built more opportunities for coding in the lower grades and offers an after-school class for young makers. This spring, they plan to start a new club with a focus on 3D design and printing, along with building drones. At St. Matthew’s, they built it, and they have indeed come. John Umekubo is the director of technology at St. Matthew’s Parish School in Pacific Palisades, CA.